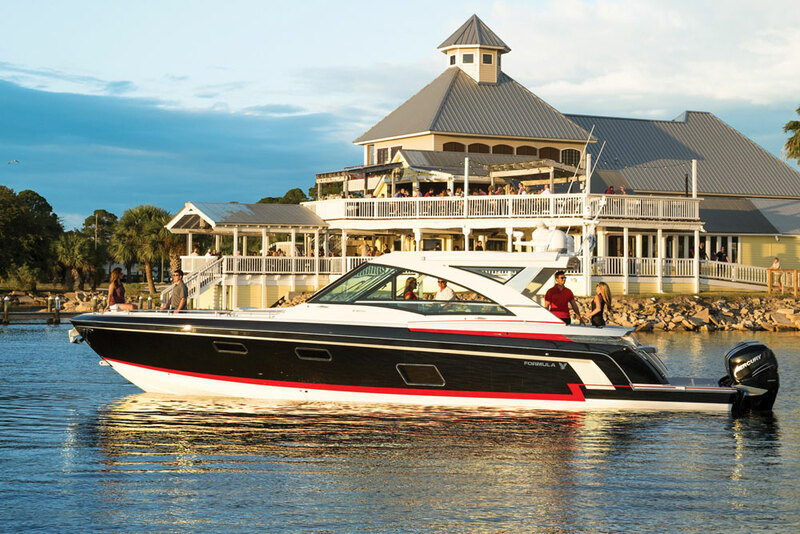 The 2017 Formula 350 CBR is a new type of sport cruiser, for this well-established boat builder. Formula is known for building stern-drive powered sport cruisers, but if you saw our review of their new 430 SSC then you know that they’ve begun experimenting with outboards—and the 350 CBR Outboard is their next hull to hit the water with eggbeaters on the transom. If you want you can still get this model with traditional stern-drives, and there’s even a version of the 350 CBR with Ilmore One Drives. Of course, neither of these innie-outtie systems offer the ability to strap twin Mercury Racing 400R or triple 300 or 350 HP Mercury Verados across the transom. If you’re curious as to how the incorporation of outboards affects the boat’s layout and appearance, check out this short First Look Video, which we shot at the 2016 Fort Lauderdale International Boat Show when the 350 CBR Outboard was unveiled. 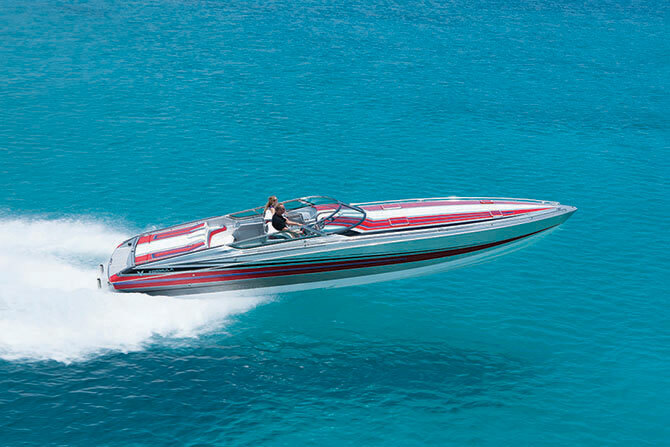 Other than the power change, the 350 CBR Outboard is much like its stern-drive brethren. The bow has a huge cockpit with seating for a half-dozen people plus a removable cocktail table. As is usually the case with Formula the seating is a cut above the norm, incorporating DriFast multi-density foam, vinyls treated with anti-microbial PreFixx (which makes it scuff- and chemical-resistant), and Tenara weather-resistant thread. Entry is via a port-side walkthrough, since the cabin is off-center and to starboard. Outboard fans have an all new option from Formula: the 350 CBR Outboard. More about that cabin: While 35’ is huge for a day-boat, it isn’t giant for a cabin-equipped cruiser. But Formula packs in a lot belowdecks. 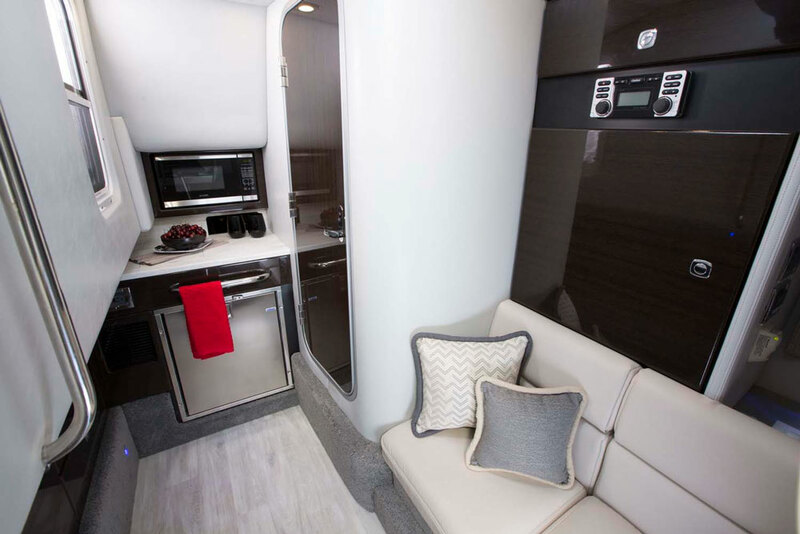 There’s a small galley area, a small hanging locker, a surprisingly roomy fully-enclosed stand-up head, a settee, and a mid-cabin berth with a Sensus memory-foam mattress. The finish can be cherry, ash, or wenge, and the sole is either cherry or birch. Weekending on this boat will be comfortable, and the cabin’s large enough to provide a refuge for a handful of people when the weather gets uncooperative. The galley is sufficient but minimal, partially because Formula dedicated a significant amount of space to ensuring that the fully-enclosed head wasn’t cramped. 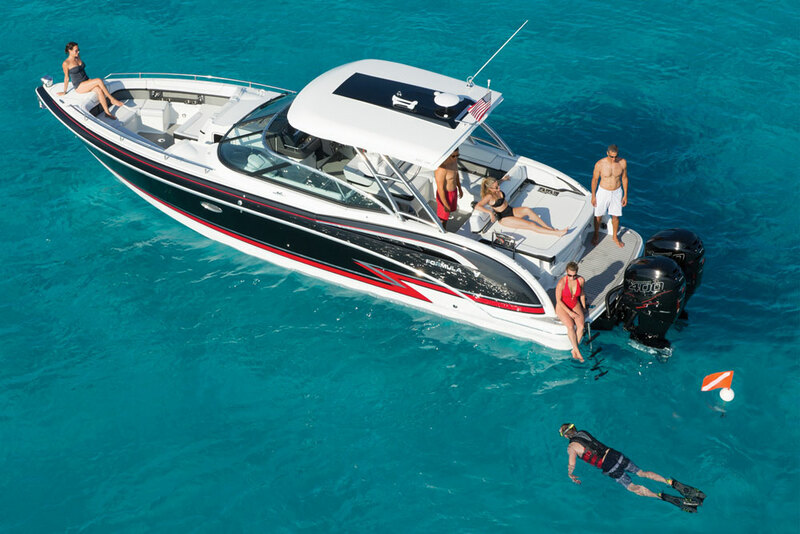 Still, though the 350 CBR is a “crossover” boat (CBR stands for Crossover Bowrider), the main emphasis is clearly on outdoor spaces. The cabin doesn’t eat much out of the bow cockpit, and the aft cockpit is every bit as roomy and spacious as it would be on a full-time day-boat. To say the seating is copious would be selling it short. Between the double-wide helm, the big lounge/dinette behind it, and the lounge to port, there’s room for a dozen people to relax. The seat-back for the aft section of the settee flips forward, turning the large aft-facing lounge at the transom into a prime tanning spot overlooking the swim platform. Naturally, there’s also a wet bar in the aft cockpit. It includes a sink, refrigerator, and wastebasket, plus stowage. Construction-wise the 350 CBR Outboard is Formula, through and through. The hull matrix is built with Perma Panel, and cavities are foam-filled. 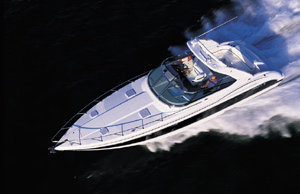 Formula both mechanically and chemically bonds the hull-to-deck joint, a common problem area for lesser-built boats. Fittings are 316L-grade stainless-steel, rocker switches at the helm are waterproof and have breakers, and graphics are in Imron. Formula backs it all up with a five-year protection plan and a 10-year structural warranty. What are you going to have to pay for all this? 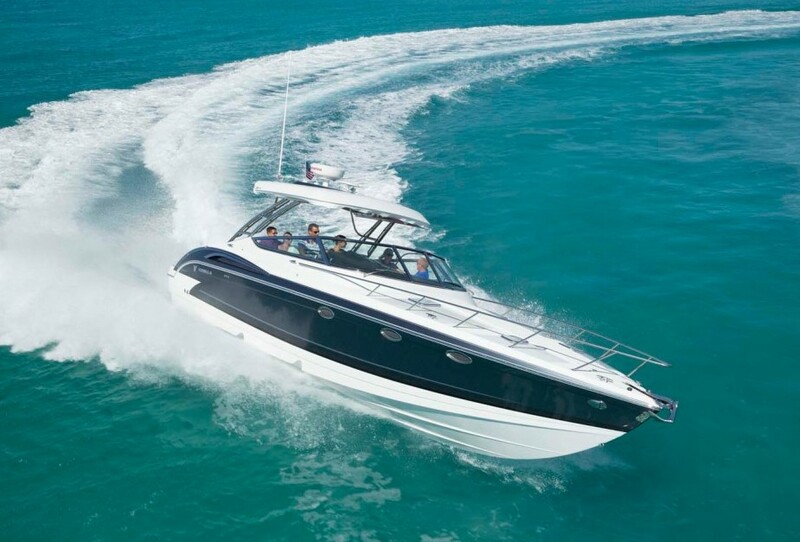 As of this writing the MSRP runs close to $500K but on Formula’s web site Boatbuilder you’ll see a “discounted” bottom line closer to $360,000 (with triple 300 HP Verados) prior to figuring in taxes and registration. But that’s a base boat, without important options like air conditioning, a generator, a VHF radio, and the hard top. Real-world pricing for most buyers will probably be in the $400,000 to $500,000 range, depending on how jazzed up you want it. Wait a sec—why would someone choose the outboard version of the 350 CBR in the first place? What’s wrong with the stern-drive model? Well, nothing. But today’s outboards are incredibly smooth and quiet. They’re extremely reliable, and eliminate the usual stern-drive boot and lower unit issues. Pushing the powerplants to the back of the swim platform boosts interior useable space (though it does cut into the platform’s useable space a bit). There’s a strong argument to be made for hanging outboards on a model like the 350 CBR. And starting in 2017, Formula’s making it. 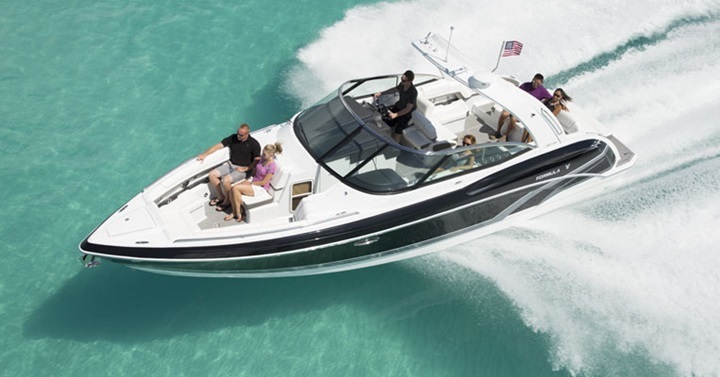 Other Choices: The Cruisers 328 Bow Rider is another crossover, but this one doesn’t offer the outboard option. Same goes for the Cobalt 336. 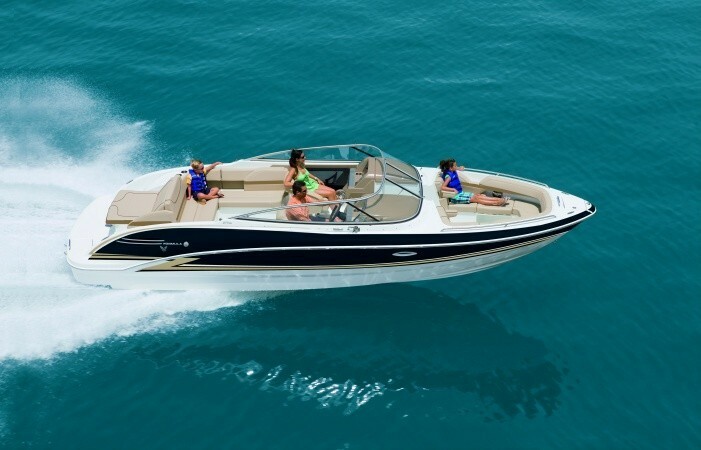 If you’re looking for a boat in this size range which places all the emphasis on maximizing the outdoor space instead of adding a cabin, check out the Sea Ray 350 SLX. 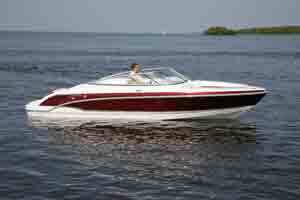 For more information, visit Formula Boats. See Formula 350 CBR listings.